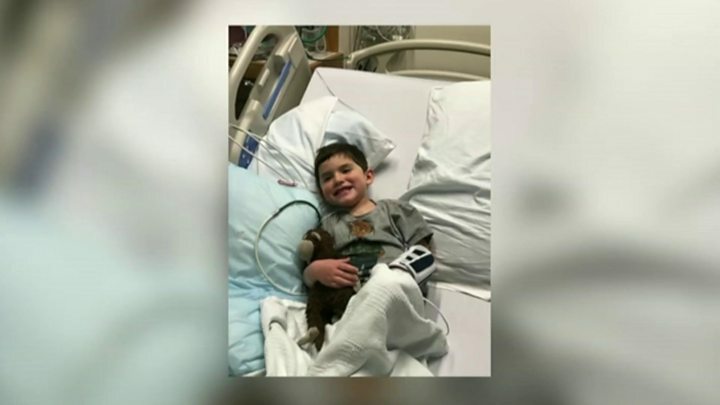 A four-year-old boy, who was flown to America for pioneering heart tumour surgery, is said to be "doing well". The parents of Freddy Vallender, from Bawdrip, near Bridgwater, Somerset, raised £90,000 for him to travel for an operation to remove a tumour. Boston Children's Hospital is the only place in the world to offer the treatment which will allow him to live a normal life. Freddy had the operation at the end of last month and is now recovering. His mother, Cathryn Vallender, said doctors were "really, really pleased" with his progress. "Whilst we've still got some testing and some follow-ups to come, we couldn't be happier at the moment," she said. "Freddy is back to his usual self, trying to fight his brother, despite being told not to by the doctors." He suffered a cardiac arrest when he was four months old and was saved by paramedics and a neighbour who performed CPR. It was discovered he had a fibroma, 5cm by 3.5cm, filling two thirds of his ventricle. Before he flew to the USA for treatment he underwent several procedures in the UK, including three heart operations and a defibrillator implant. Because the treatment is so rare, a consultant heart surgeon from Bristol Children's Hospital, Andrew Parry, flew to Boston to observe the operation being carried out. "The point of going was to learn the technique, learn all the little details which make it an operation that can go successfully, and then to bring them back here", he said. "So we can look after other little ones who have the same sort of tumour that Freddy had, so we can look after them at home and they don't have to go abroad." Freddy is expected to remain in hospital for several more weeks while he continues to recover.